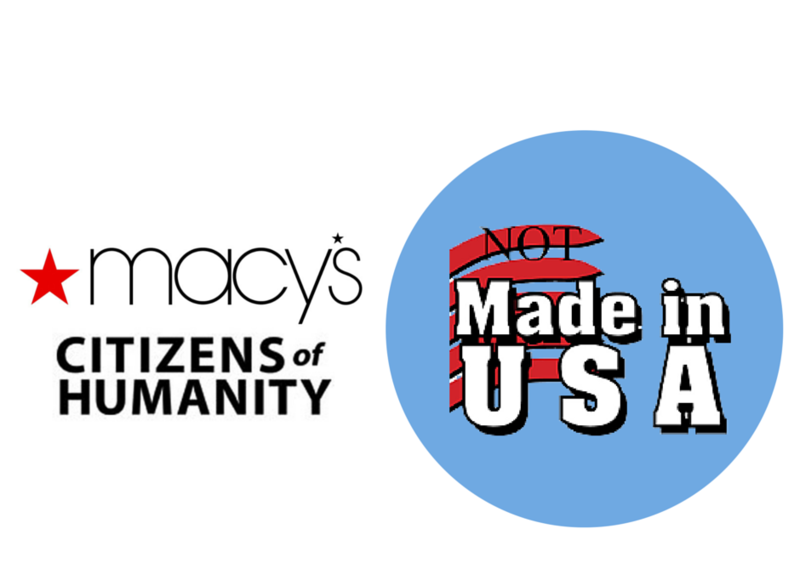 A consumer moved for partial summary judgment Wednesday in California federal court in a class action against Macy’s Inc. and luxury denim brand Citizens of Humanity LLC over allegedly false “Made in the USA” labeling, seeking to score a win on two state law claims. Plaintiff Louise Clark argued in her motion that it is undisputed that Macy’s and Citizens violated California’s Unfair Competition Law and its “Made in U.S.A.” statute, saying the companies had acknowledged that a $218 pair of jeans purchased in San Diego County contained foreign-made parts. Clark claimed in her motion that in response to her amended complaint Macy’s and Citizens acknowledged that “Made in the USA” appears on the outer label of some of the denim brand’s Boyfriend jeans with parts manufactured outside the U.S., which she said triggers their liability under California law. Clark’s bid for partial summary judgment follows U.S. District Judge Janis L. Sammartino’s April ruling knocking down Macy’s and Citizens’ attempt to shake the suit. The companies had argued that the state statute cited by Clark is antiquated and preempted by the Federal Trade Commission Act, which was amended in 1994 to address “Made in the USA” labels. Counsel for Macy’s and Citizens of Humanity did not immediately respond to a request for comment on Thursday. Clark and Robyn Marnell sued the defendants in June 2014, claiming Citizens’ Boyfriend jeans includes imported parts including fabric, thread, rivets and buttons. Amazon.com Inc. subsidiary BOP LLC, which does business as online fashion retailer Shopbop, was added as a defendant in November, but both BOP and Martell were dismissed from the dispute without prejudice in early June. Clark is represented by John H. Donboli, J.L. Sean Slattery and David P Hall of Del Mar Law Group LLP and Nancy A. Kulesa, Shannon L. Hopkins and Stephanie A. Bartone of Levi & Korsinsky LLP. Macy’s and Citizens of Humanity are represented by Peter W. Ross and Michael A. Bowse of Browne George Ross LLP. The case is Louise Clark v. Citizens of Humanity LLC et al., case number 3:14-cv-01404, in the U.S. District Court for the Southern District of California.